Help your workers manage and share information at high speed with the SP 4510SF, a compact monochrome MFP that copies, prints, scans and faxes. Even if your office runs on a tight budget and limited space, you can still make it easy for your workers to speed through copying, printing, scanning and faxing tasks to put information into the hands of those who need it. 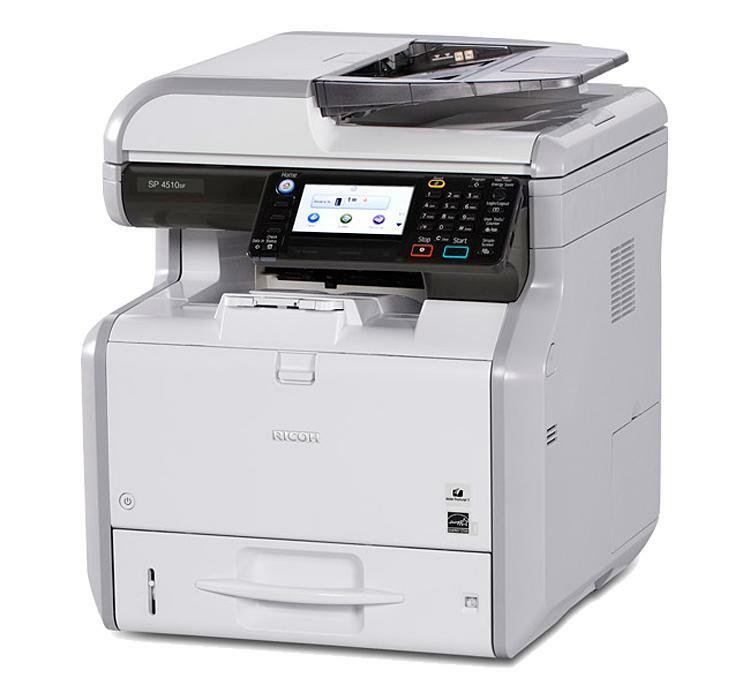 The compact RICOH SP 4510SF fits nearly anywhere, even on a desktop, and it raises the quality bar with 1,200 crisp dots per inch and a speed of up to 42 pages per minute. • Share documents with scan-to-email, folder, URL, USB device or SD card. • Create searchable PDFs when you scan using the optical character reader (OCR) option. • Scan two-sided documents like IDs and patient insurance cards onto a single sheet of paper. The RICOH SP 4510DN’s energy-efficiency credentials include EPEAT® Silver (EPEAT is a global environmental rating system for electronic products) and ENERGY STAR® specifications. The device's automatic startup and shutdown conserve energy when you’re out of the office. And, you can easily recycle toner cartridges and containers. When dealing with sensitive information, set up user authentication controls — a card swipe or login and password entry at the device to release documents. Embedded encryption helps to protect images and data on the hard drive. Save time by customizing device controls with shortcuts. They're easy to set up on the 4.3" color touch panel home screen. Need to work on the go? Bring your work with you on a USB stick or SD card. Or, use your smart phone or tablet for mobile printing. The optional Integrated Cloud Environment (ICE) service from Ricoh lets you print from or scan to apps like DocumentMall™, Evernote™, Dropbox™ or Google Drive™ without expensive on-site servers, system integration or software updates.